idmatch technology has been specially designed to ensure you enjoy the utmost comfort, wellbeing and performance levels whilst you ride. 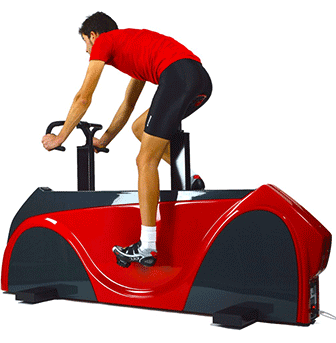 Using a series of sophisticated instruments and software, we have developed solutions that can perfectly match your body shape to your cycling equipment. idmatch is the end result of scientific research work carried out by the Ergoview Laboratories in collaboration with Selle Italia. It helps cyclists to determine their ideal seat size and find their best stance on the bike. idmatch uses a strict scientific method to help you to find the size, alignment and equipment that fits your physical shape. Creating products based on studies and research carried out into the human body, scientific measurements to identify the ideal saddle size and a tool which is a world first for accurately positioning cleats. Find your ideal seat size. Using a strict scientific measurement process that only takes 30 seconds, a sophisticated algorithm and some straightforward anthropometrical data, any cyclist can now find his own ideal solution in terms of comfort and performance. Position the cleats with absolute precision on your foot. Unique in the world, this measurement system takes just a few seconds to gauge the size of the foot directly from the sole of the shoe. The whole range of sizes are available to try free of charge. With the Saddle Test, we make available to cyclists all the various saddle sizes for them to try out directly on the road before they make a purchase. The first completely automated bike-fitting system in the world which doesn’t need markers to work because it uses a biomechanical analysis system with an automated 3D full-body scan and self-adaptation of the position. Founded and directed by Professor Luca Bartoli, Ergoview is one of the most important laboratories for ergonomics in Europe. In collaboration with Selle Italia, over the years it has developed a research system which examines the physiology and mechanics of sporting activities. Applied to idmatch, this has led to a method which determines the ideal saddle for any cyclist.